With landowners footing the bill, 60 km of North Zealand’s coastline will be protected against erosion in the future. North Zealand’s coastline has been hit hard by storms in recent years. 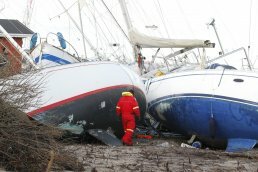 Storm Bodil in 2013 caused 11.5 million EUR worth of damage in the area alone. The conclusion is clear: North Zealand’s coastline needs protection. Therefore, Gribskov, Halsnæs and Helsingør municipalities have joined forces on the comprehensive coastal protection project: The Future of the North Coast. The project will prevent erosion and secure the coast against extreme weather which is projected to become more frequent with climate change. Feeding the beach with sand and gravel and creating protective rock structures will protect properties, natural sites and cultural assets on the 60 km coast line. Although the project is still in the planning phase, it is expected to be completed by 2021. The unpredictable and extreme weather caused by climate change increases the risk of erosion and flooding of the Danish coasts. Feeding the coast with sand is not new in itself, but the project’s public-private funding model is noteworthy. The landowners who live closest to the coast and are in most need of protection are covering some of the 47 million EUR total bill. This approach is both innovative in terms of climate change adaptation funding, and a fair model, given that the total assessed land value may rise by as much as 242 million EUR as a result of the project. The project enhances the resistance of coastal properties and infrastructure against extreme weather, while preserving beaches that are part of Danish cultural and natural heritage. By securing the beach and coastal areas on Zealand's north coast against erosion, the project preserves natural habitats and ecosystems for both plant and animal life. The project is based on cross-municipal cooperation and an innovative funding model, where both landowners and municipalities increase long-term environmental and economic value.